is critical for several reasons. 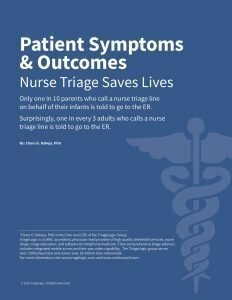 First, let us clarify what is a triage level? Why is it important to get to the proper triage level as quickly as possible? minute lost leads to adverse consequences that may impact the patient for the rest of their life. of care to prevent any unnecessary cost for the patient. best suited for your organization. If you would like more tips on using the Schmitt-Thompson protocols to provide the appropriate triage level of care, download our free eBook: Patient Symptoms & Outcomes. TriageLogic® Announces Continuwell ®– An Innovative Nurse-First Model to Improve Telehealth.